Dominican Center supporters celebrate the achievements of Amani residents and raise money for continued investment in resident identified priorities. Please join us! 2019 Spring Fundraiser: Hold On To your hats! 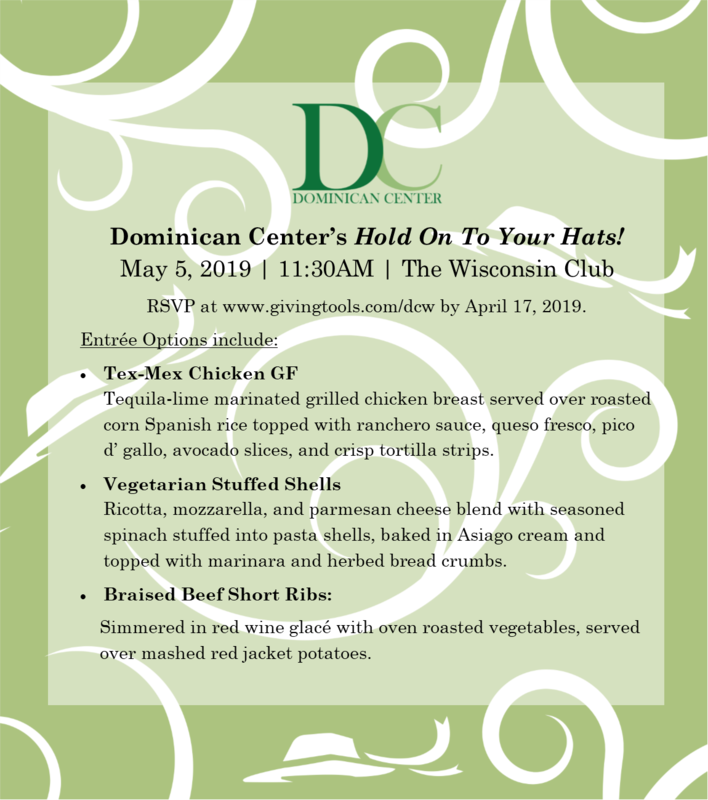 You are invited to Dominican's Center's Hold On To Your Hats! fundraiser on Sunday, May 5, 2019 at 11:30AM at The Wisconsin Club, 900 West Wisconsin Avenue, Milwaukee, Wisconsin, 53233. Proceeds from this event support Amani resident identified priorities including: neighborhood safety, housing and economic development, education, and family well-being. For a descriptive list of the entree items, click here. ​RSVP online at www.givingtools.com/dcw by April 17, 2019! Check this page regularly for event updates! SPECIAL THANK YOU TO OUR 2019 SPONSORS! ​Thank you to everyone who supported and attended the Dominican Center's Hat Trick event on Sunday, April 15, 2018! We are grateful for your commitment to working with Amani Residents and Dominican Center partners to build a better future. Proceeds from this event support Amani resident identified priorities, including: neighborhood safety, housing and economic development, education, and family well-being. ​Thank you for attending the Dominican Center's Annual Spring Fundraiser. Your participation made this event a success and helps us fulfill our mission of working with Amani neighborhood residents and partners to build a better future. Click here for event program and slideshow. 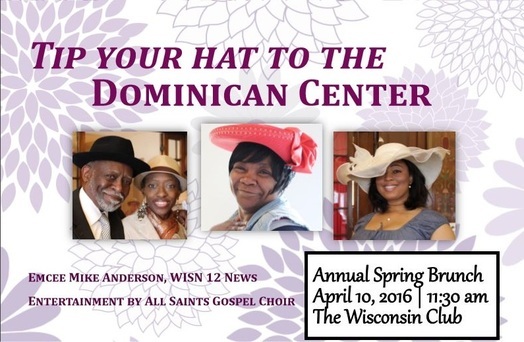 Bright sunshine, spring flowers, and colorful hats filled the Wisconsin Club on April 12, 2015 as more than 150 friends gathered to celebrate the Dominican Center's 20th anniversary. In addition to the silent auction, heartfelt speakers and the All Saints gospel choir recognized the DCW's impact in the community. A special thanks to our sponsors Northwestern Mutual Foundation, BMO Harris, Children's Hospital of Wisconsin, Greater Milwaukee Foundation, LISC of Milwaukee, Associated Bank, and We Energies. Thank you to individual donors Chuck Klawitter and John Kordsmeir for their generous donations. On April 21, 2013, we had a wonderful gathering at the Wisconsin Club, celebrating with our friends.Over 170 guests enjoyed viewing the many auction items, and eagerly awaited the results of the silent bids to see if they would be going home with a treasured item. A very fine brunch was served up with great style. Stories were shared by Diane and Vanessa about how our programs impacted their lives, encouraging us to continue. Denise explained how the Building Neighborhood Capacity Program is empowering residents, giving them a voice in their neighborhoods. Special thanks to our corporate sponsors and event underwriters, who helped make this event a success. We thank our corporate sponsors, BMO Harris Bank and Northwestern Mutual. We thank our event underwriters, Diversified Insurance Solutions, Weiss Berzoski Brady LLP, Wixon, Mary Ann Wilkes, and Robert and Anne Trunzo.